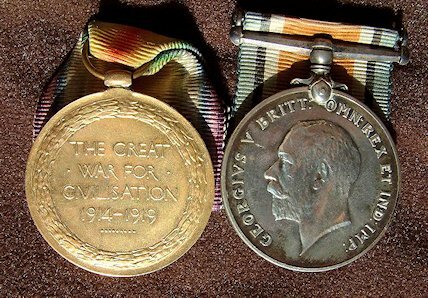 Dad's pay records indicate that on 16th October 1918, he disembarked from the troopship Erinjuera at Bombay, India. On 22nd November 1918, he received a payment of 27 rupees 12 annas at Deolali, northeast of Bombay. He must have spent about two months in India, during which time he attended a concert at the R.A.M.C Depot (Deolali). 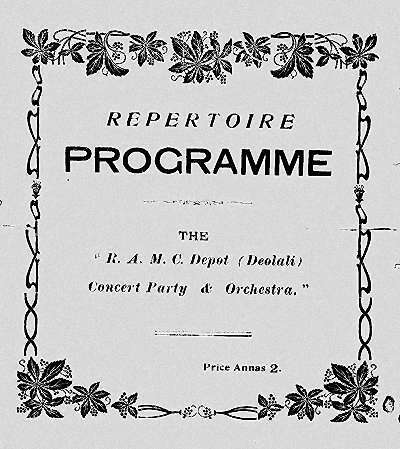 The front cover of the concert programme is shown below. Early in 1919, Dad received authority for his journey home from India. The letter of authority says that he was selected as a "Demobilizer" or "Pivotal Man", proceeding under the authority of a War Office Telegram dated 9th December 1918, addressed to the Commander-in-Chief, India. The letter is signed on behalf of the Officer Commanding No.1 Reserve Battalion (India), Station Bangalore, and is dated 17th January 1919. A further document (see below) was signed by the Officer Commanding the Transit Camp, Port Said, Egypt, and dated 1st February 1919. 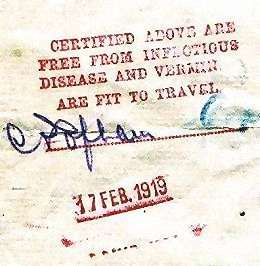 On the reverse of this document is a signed statment (right) that Dad was "free from infectious diseases and vermin". It is dated 17th February 1919. These documents tell us that Dad's route home from India to the United Kingdom, took him through the Suez Canal, and then westwards, across the Mediterranean Sea and through the Straits of Gibralta. I remember him telling us he saw the volcano Stromboli from the troopship, suggesting that he passed through the Straits of Messina, between Sicily and the Italian mainland. 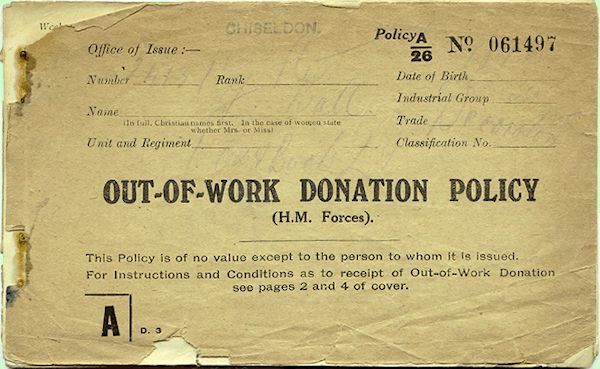 On his arrival home, he was issued with an Out of Work Donation Policy book (see below), which entitled him to claim weekly payments of 24 shillings per week (£1.20). The payments would have commenced on 16th March 1919, but evidently he didn't feel he needed the "handouts" because the book is unused! After nearly three years service, Private 24137 Ball, F.L. 's period in the Army was over. 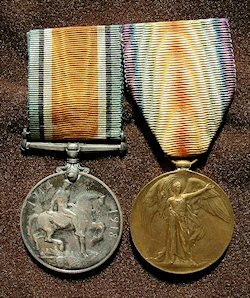 He was awarded two medals: the Victory Medal, and the British War Medal, which, together with their ribbons, are still in our possession. A copy of part of the relevant page from the Army Medal Roll is shown below. Dad's name is at the bottom. Entries in the National Roll were submitted either by the soldier himself or by his family, but Dad's entry contains at least one factual error: he enlisted in June, not February 1916. The most amazing revelation is the reference to his being hospitalised for eighteen weeks due to dysentery. We knew he suffered dysentery—his diary mentions an attack (of 'diarrhoea') in October 1917 involving a short stay in hospital—but we had no idea that he ever had an 18-week stay in hospital. Perhaps he suffered a recurrence of dysentery a year later. If so, this would explain the absence of any record between early October 1918, when he arrived in Bombay, and mid January 1919, when he began his passage home from India.